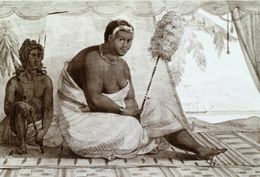 Ka'ahumanu, favorite wife of Kamehameha I, was a powerful chiefess in her own right, being the daughter of Ke'eaumoku of Kona and Namahana of Maui. She advised Kamehameha, attended meetings of the high council, and continued to govern after his death in her role as kuhina nui, or regent. She bore one child herself (though history reveals little of the child's fate), and influenced Kamehameha's sons Liholiho and Kauikeaouli. Her later marriages to Kaumuali'i of Kaua'i and Kaumuali'i's son cemented the Hawaiian kingdom's sovereignty over all of the islands. Initially resistant to Christian missionaries, Ka'ahumanu later became one of their strongest champions. She quickly learned to read and write the Hawaiian language under Hiram Bingham's instruction; she received communion for the first time in 1825; and supported Christian tenets by proclaiming civil laws based on missionary teachings.